Product prices and availability are accurate as of 2019-04-17 13:30:46 UTC and are subject to change. Any price and availability information displayed on http://www.amazon.com/ at the time of purchase will apply to the purchase of this product. Sentry Safety Panic Hardware brings you some of the best panic exit products on the market. This 120 series panic exit bar is recommended for doors with glass inserts but is also compatible with wood, steel and composite solid face doors. What's best about our products is that they can be shortened in size if needed. Just simply hacksaw the bar then attach the bar together where you need a drill and screw. The 120 Series Panic exit device is intended for dual doors that have no mullion, and is used for doors that are independent of one another. 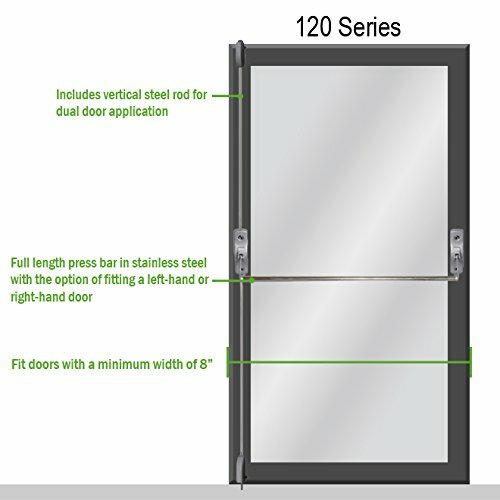 This panic push bar is exit only, however, if one door needs to have outside access to the handle it can be paired with the Sentry Safety Panic Hardware 100 series. Included with this panic bar is a steel strike for the top of the door frame, and floor keeper for the bottom of the frame or the floor. The vertical rods leading to the bottom and the top of the door are included as well.